If you like to read books then you know how difficult it is to remember where you left off last time. And for that problem they invented bookmarks and you can now have a cool Doctor Who bookmark. This bookmark is black with on that in the background pictures of Weeping Angels and the Doctor Who logo and then on top of all that in big letters the word “Don’t Blink!” and the I of blink became a Weeping Angel. And this Weeping Angel bookmark even has a fun black tassel that you can keep dangling outside of you book to make it easy to find you bookmark and the page where you should start reading again. So now every Whovian can have a special Doctor Who Weeping Angel Don’t Blink Bookmark. Are you looking for that special gift for your book loving Doctor Who fan? How about a really special bookmark? This is a bookmark made from hypo-allergenic aluminum and is hand stamped specially for you. The Doctor Who bookmark has a lip that you can mark the page and on that you can see a picture of the Tardis and then on the long part that hides in the book it says “This book is my tardis” and all this is hand stamped into the metal making yours one of a kind. Reading can be a fun as watching a Doctor Who episode and that means it deserves a Tardis bookmark. Come and have a better look at this Doctor Who Tardis Aluminum Bookmark. Reading an exciting book and have to start doing something boring? If so then you are in need of an amazing bookmark. A Doctor Who bookmark would be great of course but this is the next best thing. A Dalek bookmark. 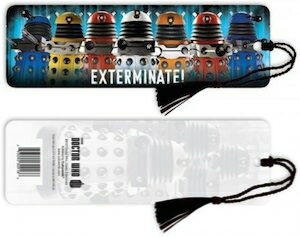 On the front of this bookmark you can find a whole row of Daleks in a all kind of “fun” colors. And then on the back you can find some Daleks in the background together with the Doctor Who logo. And this is a real bookmark so it needs a tassel and this Doctor Who bookmark has a black tassel that you can keep dangling outside your books to make finding the page you where at a lot easier. Lets mark these pages with this Doctor Who Dalek Bookmark. Paper books are still a great way to get your information. But the downside is if you don’t finish it then how do you remember where you are? A Doctor Who bookmark could make you life a lot easier as that can tell you exactly on witch page your where. This bookmark is blue on one side and white on the other and on both sides you can find a picture of the Tardis and the text “Keep Calm I’m The Doctor”. Besides having fun printing the Doctor Who bookmark even has a tassel so that you can have it stick out of your book to make it even easier to find you page. And to make sure this bookmark doesn’t get damaged when not in a Doctor Who book they put it in a sturdy sleeve that keeps it protected when not in use. 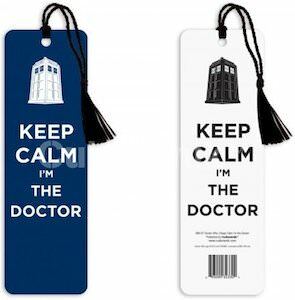 Lets mark some pages with this Doctor Who Keep Calm I’m The Doctor Bookmark.